Floyd A. Walker (see Syria) writes, "KUWAIT is even simpler [than Jordan]: just one first issue (#I) in 1923." Gibbons  states, "Kuwait, an independent Arab shaikhdom since 1756 placed itself under British protection in 1899 to counter the spread of Ottoman influence in the Arabian Gulf. 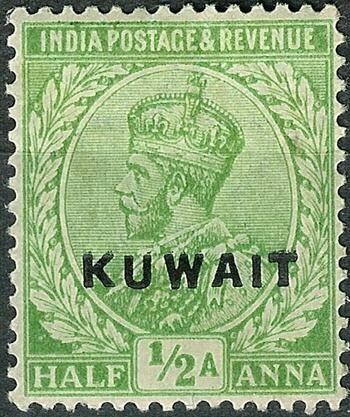 The first, somewhat limited, postal service, via Bushire, commenced with the appointment of a Political Agent to Kuwait in August 1904."